Doesn't May come around fast! Love what you have done so far. Again you're so busy. Love that and of course, love your work. I love this...my favourite colours and so well done! I really like how you do these still lifes. The colors are so clean and refreshing, just like fresh produce should be! And the background on this one adds so much to the composition! These are all wonderful! They should be hanging in a row in somebody's kitchen, or a restaurant. Love your beets and lemons below too. I love your beets - did you use beet juice for the color? They look so real. 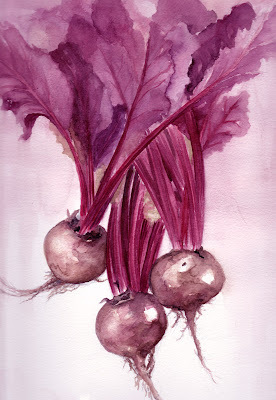 I love beets! I LOVE your skills with watercolor! Just wish you lived on this side of the world. Even though I take very few classes, I would be so interested to watch you work. Have you ever done a video? The color on this is beautiful! I think this is my favorite so far of 'everyday in may'. It's really gorgeous!